More than 200 ex-servicemen participated in a demonstration yesterday to show their support to the military and call Facebook to reinstate military Facebook accounts. Locals from Kachin State say they are worried about their safety after a villager was injured by dynamite blasts in the Hpakant jade mines. A Burmese soldier was shot and killed at the Wingaba field in Sittwe town, Rakhine State last night. Protesters took to downtown Rangoon on Sunday calling for the public’s right to information and the freedom of Wa Lone and Kyaw Soe Oo. An outbreak of flu has claimed five deaths in the Naga self-administered zone in northern Burma. Students in Sagaing Division are angry over restrictions to distance education. The Monday conviction of Reuters journalists Wa Lone and Kyaw Soe Oo have triggered protests country-wide, with media denouncing the sentence of seven years jail time with hard labour. Pan Ei Mon and Chit Su Win have demanded their convicted husbands are immediately released, after they were sentenced to seven years imprisonment under the Official Secrets Act on Monday. Wa Lone and Kyaw Soe Oo were sentenced to seven years prison after being found guilty of violating the Official Secrets Act. Among those displaced by war in Kachin State over the past seven years, the day-to-day struggles of life and livelihood are paramount. In this episode of DVB’s “Fix It” programme, we look at how some of the many IDPs in Kachin State labour to make ends meet in the face of prolonged war-time hardship. The verdict in the case of detained Reuters journalists has been delayed, citing the assigned judge’s poor health. 88 Generation political activist Ma Mee Mee was killed in a car crash in Irrawaddy Division, after returning from a funeral in Pathein. A fire in Rangoon’s iconic hospital forced the evacuation of patients and staff. Commemorations of the 30th anniversary of the 8888 Uprising, which kicked off at the University of Yangon on Monday, are underway in cities and town throughout the country today. Amid an ongoing civil war in northern Burma, some are on a different “front lines,” of sorts — facing legal consequences for protesting the conflict, or otherwise working to bring an end to the fighting. The latest iteration of the “21st Century Panglong Conference” concluded on Monday with participants signing 14 points of agreement as the high-level peace confab came to a close in the capital Naypyidaw. A landslide at a jade mine in Kachin State’s Hpakant Township over the weekend has claimed at least 17 lives and injured dozens of others, with many more feared dead as search and rescue efforts continue. 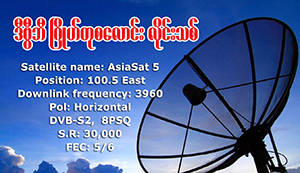 A total of 69 people have filed for candidature to contest Burma’s upcoming by-election, a Union Election Commission (UEC) official has told DVB. Economic development and “trust-building” were two key topics of a DVB Business Debate held earlier this year in Thandwe, Rakhine State, where panelists discussed the fraught inter-communal dynamics still bedeviling the state.